This exhibition is taking place at the Musée des Arts Décoratifs in Paris and is on until July 19, 2015 and is worth a little detour. Why? 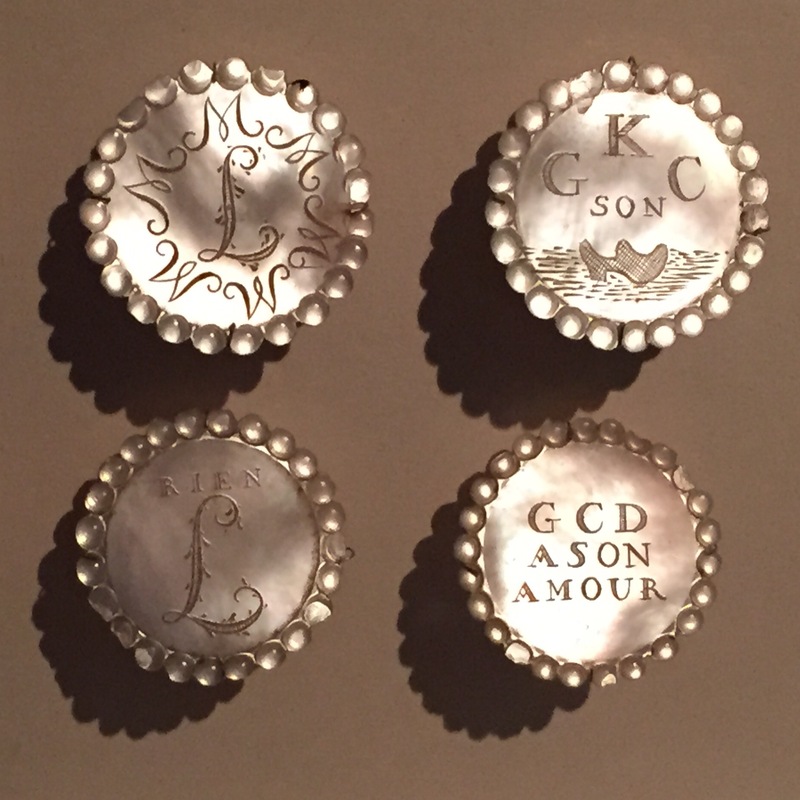 First because this collection of over 3,000 button is unique in the world and has been classified as a Work of Major Heritage Interest by the Consultative Commission on National Treasures. Second, this collection will take you through the 18th, 19th and 20th century in a very interesting and unusual manner. Moreover, it highlights a very often unperceived detail which is actually very much worth every attention. The craftsmanship and skills involved in the making of these pieces of of very often priceless material is absolutely remarkable. The collection has been gathered by Loïc Allio and if at all possible, try to have him guide you through this exhibition. He has a remarkable knowledge on the topic that is worth benefiting from. He has a story on (almost) every button. I found these mother-of-pearl “message button” very witty. In the top left-hand corner: the engraving L M, which is phonetic for “elle aime”, meaning she loves. Present from a man to his lover. Top right-hand corner: “G K C SON -image”, which means “I broke her clog”. You find the meaning. Bottom left hand corner: “Rien (which is on top of an) L”. Phonetics for “nothing on her”. 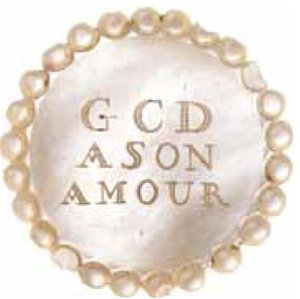 And finally, bottom right hand corner: engraving says “G CD A SON AMOUR”, which is phonetic writing for “j’ai cédé à son amour” which means “I gave in to his love”. 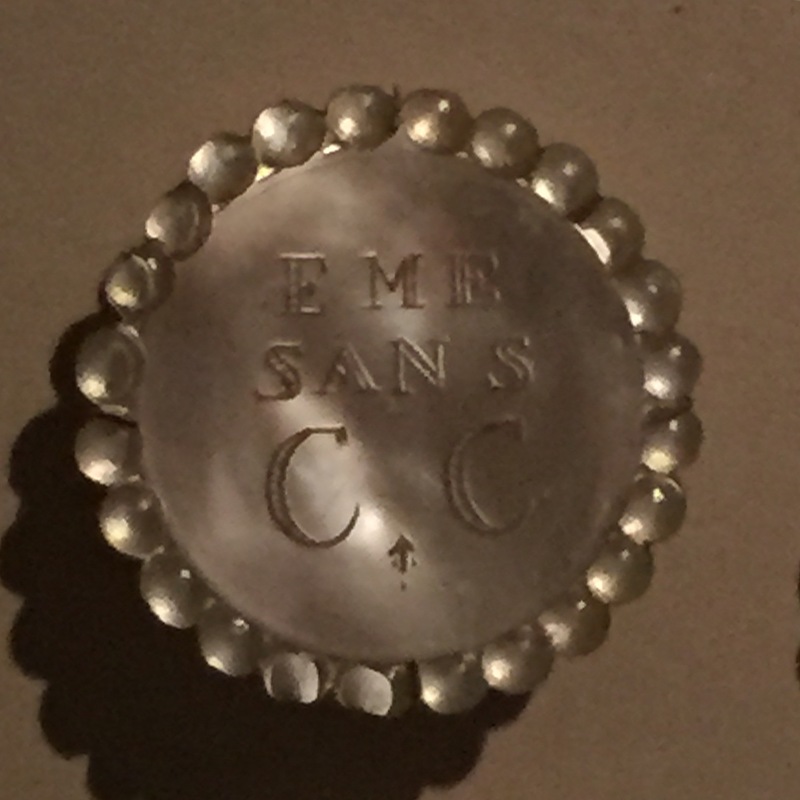 Engraving says: “EME SANS CC” phonetics for “Aime sans cesser” which is “love forever”. (I apologise for the quality of the picture, but I thought I would share it anyways).